Next in my series of contemporary artists that I’ve discovered is Roberto Ferri. 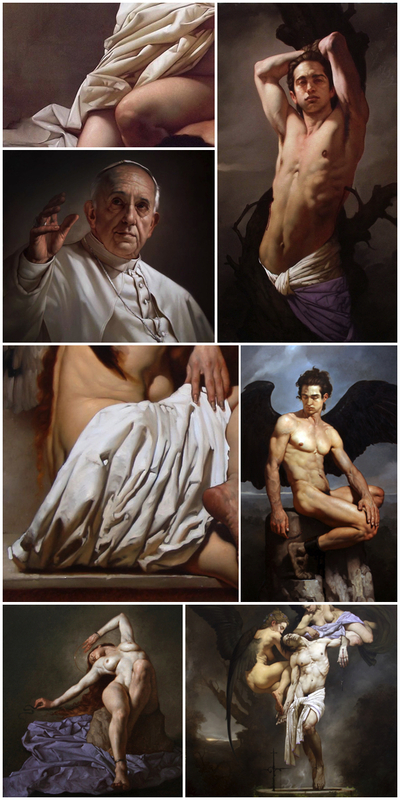 From Taranto, Italy this 34 year old artist is highly influenced by Baroque Art, in particular Caravaggio. I was struck by his wonderful use of light as well as how his subject matter was fairly classical with an interesting supernatural feel at times. His figures are beautifully painted and almost always posed in a twisting, tortured manner. I tend towards painting that is a bit more painterly (he is pushing towards hyper realism), but I can’t deny my attraction to his work. Searching Google or Pinterest you’ll find tons of his paintings. His website is beautiful and there you’ll see his latest work. I’m particularly taken with his portrait of Pope Francis. Previous Over a movie?! Really?! How kind of you to say. I’m loving your portraits as well.